2. 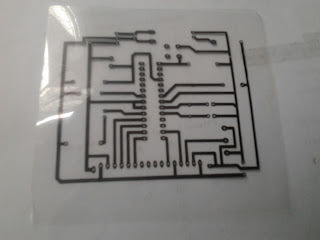 First, Print PCB Layout. 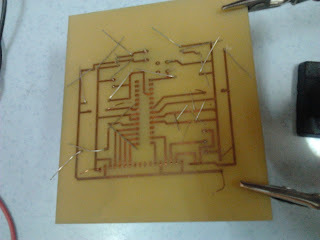 The PCB layout for the project is drawing by using Diptrace software ( refer last week). After drawing the circuit, the layout must be print on a transparency sheets rather than any kind of paper so that the Ultra Violet (UV) can pass through the clear bits well enough to give a good exposure. Overhead Projector (OHP) paper is a transparency paper that suitable to be use as a print paper. Naturally it must ensure the printing is exactly 100% full-scale. 3. Ultra Violet (UV) Exposure. This process have been done at PCB room at level 1 Unikl BMI.For the UV board,one of the sides is copper clad and this copper has a photosensitive coating. When the plastic film is peeled back this sensitive coating is revealed.After processing this will be the PCB. The Ultra Violet (UV) box as an Ultra Violet (UV) exposure. Printed mask must dry else it will stick to the UV coating on the PCB and will ruin it. 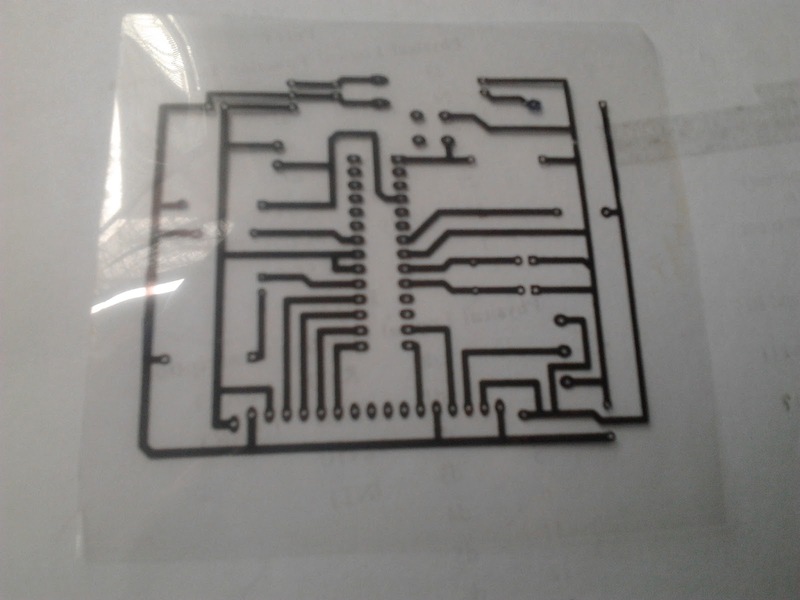 It must be careful to ensure that the PCB mask is the right way up, otherwise when the circuit is etched it will discover that the tracks are also the wrong way round. The Overhead Projector (OHP) paper transparency with the printed side has placed against the copper coating and the two faces has put down in the light box. Then, the cover has closed, switched on the UV box and allow 60 to 90 second exposure times. When the exposure time is end, and then switched off the UV box and PCB is remove from the box. It will not see any visible change in the coating at this point. The developing solution is just sodium hydroxide crystals that dissolved in cold about 20 degrees Celsius and too much solution has just stripped everything from the board. Then as simply placed the UV exposed PCB in the developing solution and rocks the tray gentled for a few minutes. As a caution, the developing is avoided from direct bright sunlight. Within a few minutes the circuit has stand out dark and the exposed coating washed away. Before removing the PCB from the tray, the copper has been shiny against the dark track layout. When the board is taken out of the developer it must be washed in clean water before transferring to the etching tank. Always use plastic tongs.The acid, Ferric Chloride (FeCl3) is used to etch away copper that is not protected by the remaining photo resist coating FeCl3 often comes in bags in its an hydrous from dried orange-brown colored crystals. The etchant is held in a ‘bubble etch tank’ and is heated. This solution slowly etches away the unwanted copper, leaving the tracks only. At this stage it is important to keep checking that the PCB is completed (time - 15 to 45 minutes). If it is left in the tank too long the copper tracks will also be removed or damaged. The remaining UV coating has been cleaned off. Alternatively, has used the thinner to remove the dark line as in. When removed from the etching solution, the PCB is washed and a PCB eraser is used to remove any film from the tracks. This must be done carefully because the film will prevent good soldering of the components to the PCB. The tracks can be checked using a magnifying glass. If there are gaps in the tracks, sometimes they can be repaired using wire but usually a new PCB has to be etched. Lastly, the PCB has been drilled according to the circuit. The components have been inserting on the board and started soldering the component’s leg.